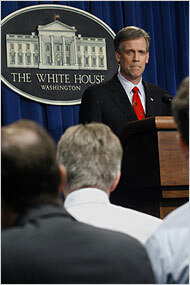 My mind’s been on Tony Snow lately. Gitell.com’s thoughts go out to him. When I learned that Snow, who became press secretary a year ago, had undergone chemotherapy in 2005, I was very surprised that he took that job. Press secretary for the White House is one of the most all-consuming jobs anyone can have. Ari Fleischer told me in September that the job was “the most rewarding, intellectually stimulating, fascinating, wonderful, most grinding, grueling, pressure filled” he could ever do in his life. Given the problems in working for such a problem-plagued administration, one in its waning days where the prospects of things getting any better are dim, Snow had a hard enough road in front of him. For many of his predecessors, such as George Stephanopoulos, who briefly did it at the beginning of the Clinton Administration, the press secretary position is a stepping stone to a career in the big-time media. But Snow, a former Fox News personality, already had that. Granted, he won for himself, unlike Scott McClellan, the important right to participate in principals’ meetings, which made the job desirable. Still, with some sense of what a job like this is really like — far more grind than glamour — I can’t imagine the incredible pressure Snow’s been under. He’s got daily questions about the U.S. Attorneys scandal, fall-out from the Scooter Libbey trial, Iraq. And he has to deal with them. Think about that professional stress with the threat of cancer hanging over your head. All I can say is the guy must be a true believer. Like Elizabeth Edwards who has encouraged her husband to press on with his campaign, Snow is putting the greater struggle above himself. In both cases, it’s moving and heart-breaking.